Chard is an under-appreciated yet healthy option in any dish where spinach is usually used. This healthy, tasty quiche can be eaten at any time of day. Make it for dinner and warm the leftovers up for weekday breakfasts. Sundried tomatoes, which are low-FODMAP in small portions, add a nice sweet-tart tomato taste without watering down the quiche. Preheat oven to 425F. Very generously grease a pie pan about 9 inches x 1 ¼ inches deep. In a medium, microwave-safe bowl, thaw potatoes on 50 percent power or defrost cycle, just until thawed but cool (a few frozen shreds are fine). Alternatively, place frozen hash browns in a bowl and thaw overnight in the refrigerator. Place a double layer of paper towels several sheets wide on a work surface. Spread potatoes in a thin layer. Top with more paper towels and press down to extract water. Potatoes will be reduced to 2 cups. Reserve paper towels to use again for drying the cooked chard. Press potatoes over the bottom and up the sides of the pie pan to the rim. Spray potatoes with baking spray or lightly brush with oil. Bake on the middle rack in the oven and bake until potatoes are medium golden brown around the top edge, 15 to 20 minutes. Remove from oven. Turn the oven down to 400F. While the crust is baking, in a small bowl, soak sun-dried tomatoes in 1/2 cup of boiling water until pliable, about 10 minutes. Drain and finely chop. In a 1 or 2-quart saucepan with a lid, stir together the Swiss chard and the remaining ½ cup water. Cover and simmer over medium heat, stirring occasionally, until leaves are wilted and soft, 4 to 5 minutes. Use a slotted spoon to remove leaves, leaving the liquid behind, and allow them to cool slightly. Pile leaves in a mound, wrap in the same paper towels used for potatoes and press to remove excess water. Finely chop the chard to make ½ cup. In a medium bowl, whisk together the eggs and milk. Stir in chives, basil, sage, salt and black pepper. 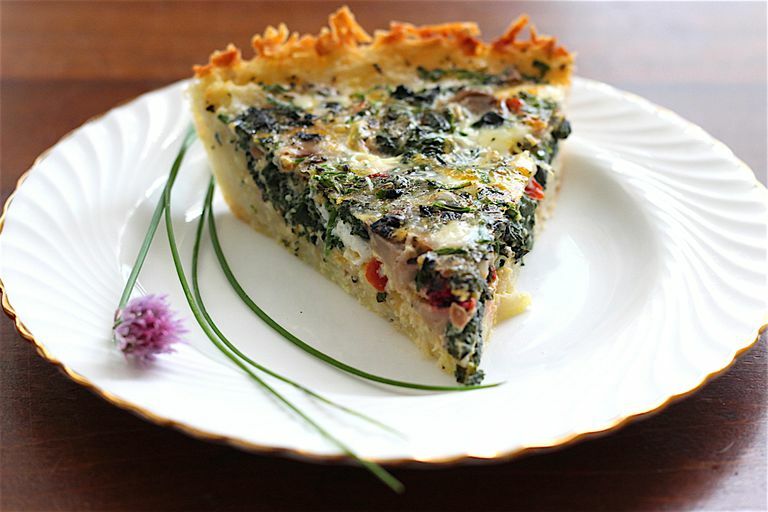 Spread chard, mushrooms, cheese, and chopped sundried tomatoes evenly over the partially baked crust. Pour egg mixture on top, filling to the rim. It may go over the edges of the potato crust. Bake until the top of the quiche is deep golden brown around the edges and quiche puffs up a little in the middle, 20 to 25 minutes. If chard isn't available, use baby spinach or beet greens instead. Replace Cheddar with Swiss cheese, Gouda, or other aged cheese. One-fourth cup fresh chopped dill can be used in place of dried basil and sage. Stick to canned tomatoes, as they are lower in FODMAPs than fresh. Chopped chard stems and ribs can be added to soups, or cooked along with whole grains. Or sauté them in olive oil for the taste and texture of bok choy stems.